I’m on the edge of my 40th birthday. It brings a sharp focus on the time spent and questions about how best to use what’s left. I’m working on a number of new paintings that reflect on some new direction I’ve taken in recent years in building healthy habits and refining the way in which I use my time. The clock ticks a little louder these days. I’ve learned that without context even the greatest information is often useless. At this late stage in my life I’m learning that the things you learn are most valuable in their application not in their accumulation or storage. 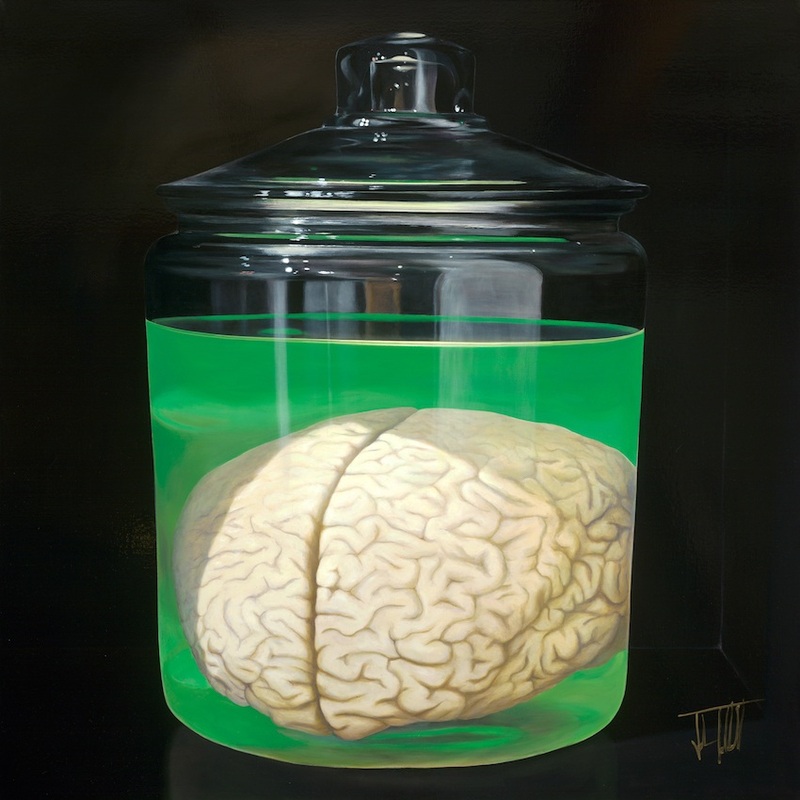 I completed the first “Brain in a jar” painting earlier this month. For years I’ve been asking people, and myself, “What are you doing with your mind?” Seems an appropriate question for us all. Are you giving it the proper chemical bath?How are you treating it or letting it treat you? Does it tell you who you are or the other way around? Identity is so very slippery. And then there are all the stories. Between a person and their brain there are all kinds of narratives interfering with our ability to see the real world. The very structure of stories is deceptive to what we might expect of real life. Terrible fears of being wrong or looking stupid guide us into hours and then life long habits of resignation to an uninvolved life. Addictions and self abuses to tell us it doesn’t really matter, none of it really matters. Just ring the pleasure bell again and all the other stuff will eventually fade away. I’m reminded of Vonnegut’s musings in “Galapagos” about the strange problems that arise from having such a large brain. My curiosity is driven by what a bizarre thing we are and how we have arisen from such a world and what future we are laying ahead of us. The comparison of our minds/brains to computers is a tired one for sure but it seems the implications of such an idea are severely neglected. For example, what kind of program(ming) might bring about the life we want? What are the optimal conditions for this computer to work properly? How might a properly working computer running and building good programs change how we use our time? As far as a brain is like a computer these seem like good questions to follow up on. With the world perched on the edge of an AI revolution these are just a few questions that really need our attention. What are we going to tell our invented gods that we want if we don’t know ourselves. Or in the immediate, how do you allocate your time when you don’t know what you want? I get a better picture of what I want with every passing year….. and less time to live it with every passing year. I want a healthy mind with which to enjoy the puzzles of existence. I want to refine my compassion and to nurture rich and meaningful relationships. I want to build useful thinking tools and understand when to use them and for what. I want to make compelling art work that shares all of this and how if feels and why it is important. This whole being a human thing is so strange. I wish you and your brain meat all the best in this uncertain world. I hope you guys will take care of each other. Audiobooks are one of the greatest technological developments for a painter. For anyone with a hands on task they are a great tool for exercising your mind as you go. As an artist I love watching how the content or thoughts from the books inserts itself back into the work that I make. This world is a bottomless pit of discovery and wonder. Here are the books I listened to this past year and a few that I’m studying that don’t really translate to audio. My audible.com wish list is LONG but if you see a book I’m missing that I should make time for feel free to pass it along. If you follow the links to any of these books you can listen to a sample free to get an idea of what they are about. I left out a few that I’m still working on and one that I wouldn’t recommend. Enjoy! The temperature outside together with sunshine has reached that magic window where I feel a little lighter in my human experience and I wear a smile a little easier. I was reheating my coffee this morning and felt it. Closed up in my tiny home full of projects has been especially cozy lately. So many projects, staring back at me and asking all manner of questions, lean against every wall. They sometimes seem so heavy as to compromise my home. Other times they illicit laughter that reminds me of my voice. I have a neighbor with a lemon tree that I have been invited to visit, and I sometime do when straightening my legs from time at my easel. She is missed around here. She used to talk to Beetle The Dog through a window that looks out at my yard. She had a precarious set of 90+ year old legs that she used to brave the unsteady land of Los Osos. she would occasionally visit small studio events or the odd gathering here. She would share stories and her frankness and playfulness would have people in stitches. Bright blue eyes showed a clear inner light so kind and real. She often talked about her great love. Her husband and the treasured relics he left behind seemed a central point in her life. The way she spoke of him gave a glimpse at the enviable beauty of their time. So many years of hurried list marking while such beauty sat at my feet. This heavy thought that has been looking back at me through my work this week. It is so urgent to me to tend the love i have found in this world. Fran knew. So thank you to all of those that love me and that I love, to all those that love. It is my belief that we are all the better for it. Yesterday in my return from the farmers market I noticed an open door at Fran’s and went to investigate. Her son is a kind and generous man. Fran passed in July. Me and Beetle will continue to miss her. It had been a time of drought and the plants of the the towns central courtyard and garden needed extra care to help them survive until the rains could come. that could keep him occupied should the work day become tedious, and allowed new thoughts to cross into his awareness for consideration. He loved his work and the time it allowed him to watch things grow. He trimmed with a light hand and watered with a special care to listen to the plants' needs. It was on a warm day. His sun weathered face glazed with perspiration, squinted at the weight of his water buckets across his shoulders. When returning to the fountain in the ring of trees the man took rest and that is when it began. The woman with pale blue eyes who lived in the shrub had come unseen into the courtyard to collect water for herself and her shrub. She carried it with her everywhere. The heavy cluster of roots tangled at her feet under the self similar branching of its interior world. Life in the shrub was safe. It moved with her and covered her. It had begun with a branch that she used as a child to shade her eyes from the burning and dulling of the sun. The branch grew and as it became a shrub it was the envelope of her life and now it seemed to have always been this way. though she cared little to venture backwards into the past or contemplating points of origin, the branches of her precious shrub were scratch with the stories of how they grew and the burnished places where her body rubbed. Her legs and body were strong from carrying such a burden. A carapace and a veil laid between her and the cold wilds and rocky places of the world. Branches are softer than stones. She had seen the gardener before but always through the litter of leaves. She had been aware of him in a peripheral way as she entered the garden but she always traveled unseen and so there was no thought of him. She bent to gather her water, as she had done so many times before, from the clear fountain in the ring of trees. This was not like other times. Her reliable shrub caught in the branch of one of the trees as she bent and it exposed her to view. It was a golden glow coming from an unfamiliar plant that the gardener saw. An arm's reach away. His hands were kind and familiar with the soil and one was on it's way to lightly inquire after this otherworldly glow in this bush. The woman's eyes sparkled back at the water and she felt the chill of the open air just as the touch of the man found the edge of her spine. She jumped and their eyes flashed one to the other in equal astonishment as the hung branch of the shrub came free and knocked them both into the fountain. The woman with the pale blue eyes now wore a welt over one of then from the returning branch, and some branches of the shrub were broken. The man had fallen squarely on the tip of his right elbow. It found the stone interior of the spring fed fountain and left the taste of pennies in his mouth. The tangle of branches and bodies struggled out of the fountain as one mass and seated on it's edge. The woman's second nature mending of her branches was interrupted by the mutual shyness of the man. She was very beautiful and the man was trying to find himself. He had just released the support of her arm as she was righted. "You care for the garden" she said blandly because so much else was happening. "Yes, Trim and water" he said and they both laughed. "The garden is beautiful and somewhat wild but I do my best to see things grow healthy and straight so that the plants are not stealing the precious light from one another." They shook hands and made introductions both wrapped in wonder. Skin is softer than branches. The dry brittleness of her home had softened but become much heavier with absorption of so much water. The roots tangled at her feet and the shrub seemed to grow in response to her feeling of vulnerability. Not to the man but to what else there way be past her shrub. The places where the branches had broken here sharp and uncomfortable though she mended them carefully. She was forced to take special care when walking downhill so as not to drag the root most corespondent with branch over her right side. And though the shrub grew to cover her quickly it would never be as comfortable as it once was. The injury to the gardeners elbow was slower to mend and impaired his ability to carry the same quantities of water but though his work was ofter slower it allowed more time for his wondering mind. They saw each other often in the garden after that. Though she saw more of him than he of her. Sometimes she would remain unseen and watch as he worked or stopped in the midday to enjoy the sandwich made for him by the bakery. Sandwiches always taste better when someone else makes it for you, she thought as she watched his eyes wander over the casual preoccupations of lunch time. Other times she would show the sparkle of her blue eyes from the shrub and he would see her and smile and they would walk together and talk about the beauty of the garden and the various predictions of the townspeople about the arrival of the rains. He had discovered her once fast asleep in her shrub at the end of his day. She had been watching him work and had rested on one of the soft gnarled limbs at her shoulder and had dozed off. He had heard her heavy breath while trimming her very shrub and saw her, smiled to himself, and used the greatest of care and a light hand to clear some of the beak brush of her home without leaving her open to the elements. They had come to care for each other greatly. He had once in his work found a nest of humming birds in a sapling not far from the fountain and he wondered at the guest she might host in her foliaged world. This beautiful woman who lived in the same world as him of green growing things, though from perhaps different perspective, was in his thoughts always. Like a bird in her own tree looking out through the leaves, he thought. But does not a bird leave it's tree to the air? The man loved the plants but it seemed to him the singular view from the inside of one could be like wearing sunglasses forever. He wanted to see her more and did his best to make her feel safe. Still he was happy to see her when she came to the garden and when she didn't he looked at all the plants differently. A steady smile enduring the mystery of the hidden or vacant woman. There were large beetles found crossing the paths in the town moving away from the dry stream beds and the old women of the village were certain the rains would arrive soon. This was a good omen for the coming wedding to be held in the courtyard. The young couple with fresh faces equal parts excited and nervous glanced at each other and walked slowly about their encampments awaiting their special day and musing at their social importance. standing near the fountain and laughing to themselves at the adornment of the procession as the rain broke. It was beautiful. It fell in sheets and raised a music out of everything it touched. It looked to be the finest of celebrations. The villages smiling in gregarious hair-streaked hellos and hugs. The woman's shrub grew heavy and her roots sucked at the wet earth, making it difficult to walk. They were each reminded of the day they met in the fountain. She let him hold her hand and the rain fell. As the ceremony came to it's most important rights and the piano in the greenhouse began to offer its soft tones under the rain, the wind came up fiercely and sent two of the tall straight trees crashing down into the congregation. The loud snapping of branches matched the shapes of the splinters sent through the air. There were cries of concern and relief as loved ones found their others unharmed. No one was injured or so it would have seemed. The woman in the shrub had pushed the gardener clear of the falling tree and it had crashed straight through her protective home. She stood shining and exposed before everyone. In the rain. The gardener on his elbow again looked up helpless to cover or protect her. The crowd was silent and aghast, what was afoot here? Before anyone could speak a thunderclap raked fire across the one of the remaining trees. In the rain the garden burned. The people scattered. The woman unhidden by her shrub ran faster than had ever been seen before. Even through the rain the man could see her glow tracking up a hillside and then disappear. He followed as well as he could but she was gone. The villages retired from the celebration that had tried to consume them. What remained of the woman's shrub wilted from glowing amber to ashen as the final light of the village went out. The dull pain of the following day hung in the smoky humid air. Inescapable to many. Even the piano in the greenhouse had been burned and looked from the outside unsalvageable. The man who had been the gardener woke aching in a puddle of ash and soot. He had been excused from his job and had set out over the hill hoping to find this woman again that he most certainly loved. He may never know even if he did find her. She could be hidden in some larger and rooted shrub, far away from any path, deliberately woven in brambles. Would she sparkle her eyes at him again? There was no way to know. There was only the things he could do. There was one man un-effected by the pall of grief and disorder cast by the storm. The shipwright was a rugged man always with his hands in his hip pockets. He knew how long it took to build a boat and how quickly they could be run aground and and sunk. He had been to sea but found he loved it better from the shore. When he met his wife that was it. He loved her and the sea from the land. The fallen trees were to be his. Tall and straight and easy to work. At least one would be the mast of his next ship. A knockabout carried by the splinters of a storm. He liked the idea and in a chuckling stride mused at the word "Windfall". He felt such gratitude for the arrangement of his world that he disrupted his stride so as not to disrupt a crossing beetle. It scrabbled across the path and under a stone. And so the ship of our story has passed over the horizon and out of view. Surely in some respect it is still being told, though it out of reach of our weary yet sparkling eyes. Though all vessels are sinking ships, a story can live forever. Some are even more soft and real than skin. "Tempo" and the pace of your life. "Tempo" 40x48 SOLD Prints available. Sometimes there is a painting that gets a tremendous response. This painting has been on display at Big Sky Cafe in San luis Obispo for several weeks now and I've had at least a call a week about it. I am very pleased with it, not just a beautiful painting but as a placeholder for a moment in time and a lesson. I am a bit of a workaholic. I hold myself to high standards and demand not only good work, but growth as well. When things get rough or opportunities don't present themselves as I think they should, I tend to knuckle down and try harder. Longer days, consuming more information, reaching in new directions. It becomes a bit of a feedback loop. The coping mechanism for my work.... is working more. It was on a day like this, phone in one hand and paintbrush in another when I had an unexpected visitor. Behind my workspace is a little greenhouse and there a hummingbird worked himself against the glass ceiling, trying ever harder to get out. It came to the point where intervention was needed and this little guy was so tired, as I offered him a perch he took it and I snapped as many shots of him as I could as I took him to the door and off he went. It was a beautiful moment. It was remarkable to have such an up close look at such a jewel of a creature. The painting began shortly after. And in the long days of staring into it I saw my relationship with my work. That is how it got it's title. "Tempo"
Sometimes the way around an obstacle is not to work harder or faster, but to relax. and at the original size 40x48 in a small edition of 10 at $1800. If any of you out there have questions about my work or would like to hear about a painting, send me an email. Open Studios, a thank you. This is a letter I wrote sharing my look at Open Studio events and public painting. It was well received and so I thought I would share it here as well. Open Studio events allow people the chance to step into (in my case) an artist's living space and see the moving pieces of their lives and work. Artists, whether we like it or not, have a foot in both worlds. The public and gregarious, and the private and contemplative. We must be able to welcome anyone into our work, and we must be able to spend long hours in our own company. These seem to be the demands of this particular way of life(or mine, I guess). I have been painting in public and welcoming people into my little world since I began showing my work 15 years ago. It presents the work in a way that is accessible to many that would not engage otherwise. Often painting in parks, patio areas of businesses, the French Quarter in New Orleans, Coffee shops all over, I have met many people and effected some. We are all constantly refining our relationship to the world around us. When someone rounds the corner and they laugh or are otherwise unexpectedly captivated by my (or any artist's)display, it makes for an atmosphere of discovery. Open Studios has this quality also. I have been in Los Osos for 5 years now and I am still learning about how I can refine my relationship to this community. I hope to grow with it. All of this sounds very serious, which is a shame. I mean it with a playful sincerity which I can better show you. I hope my work will better begin and conclude this paragraph. My way of life is often very stressful. Emotional and economic ups and downs punctuate the flourishing of imagination that I am so devoted to. I do my best to fully participate in this particular experiment that is “Being”. I arrived home and after a few days of simply soaking up the beauty it’s back to work. I have three shows in the surrounding towns that all begin in the next month. I’m in Los Angeles for a couple weeks working on some projects here for a client that I have done a lot of painting for. Upon arriving at their house this time, it occurred to me just how many hours of my life are spread out across their walls. I spent today working on the mural in Morro Bay and worrying about all the details of moving it for the festival on Sunday and so on. Today marked the fifth day of actual painting on the project and the water is really beginning to take on motion. Sign up for my newsletter and you will receive information about my latest shows and adventures.